For OJ to get caught on camera whistling any song it seems very fitting that it would be "If I Only Had A Brain" from the Wizard of Oz. 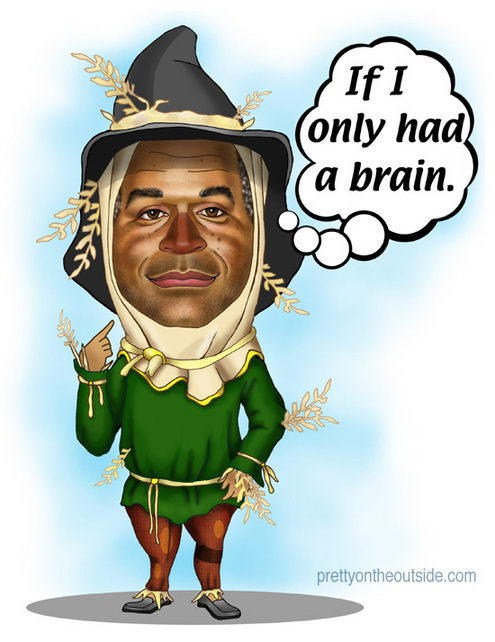 I really wanted to avoid this whole OJ mess but depicting him as the brainless scarecrow seems fitting. My apologies to the scarecrow. Ink on paper with photoshop. LOL. How true. I truly wonder what is going on in his head. I am sure that this will show up on other blog sites. This is funny as hell. Good one, David. i love everything about this. why are you so good? PERFECT!!! I love it Mr. Gilmore. You snagged him and you snagged him well. Love this!!! :)... so good... u rock my world! i swear to god i will have that song stuck in my head all day long. thanks a lot. Yeah but does he know he needs a brain? LMFAO!! Hilarious!! This says it all! It needs nothing else! !